There are three basic types of blepharitis: 1. Bacterial 2. Seborrhea 3. Demodex ( Mites). Natural treatment for blepharitis consists of proper lid hygiene. Scrubbing the eye lashes extremely well before bed time with Ocusoft foam will reduce the cause in most cases however a certain percent of patients will have demodex ( mites) on their lashes and will need to use a diluted solution of tea tree oil applied to lid margins or will need to use Cliradex a commercially prepared wipe with the components of tea tree oil in it already. The eye lid margins must first be heated well with a warm wash cloth or use the Bruder mask ( mask developed to heat the lids) , then clean lashes well with Ocusoft scrubbing foam and rinse well. 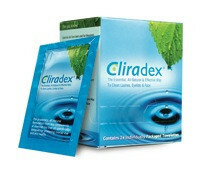 Prior to bed wipe the cleaned lids with Cliradex wipes and do not wash off. The Cliradex will kill the demodex mites that are laying eggs in the hair follicles and creating a marked case of blepharitis. So heating and cleaning the lid margins is the most important step at treating blepharitis. When the heat is being applied to the lid margins gently massage the lid margins to help open the potentially blocked Meibomian glands along the lid margins. Dr Michael Lange uses Fortifeye super omega-3 two times a day orally in his patients to help reduce the inflammation associated with blepharitis. He states this is a crucial step in the natural treatment of blepharitis. The Fortifeye Super Omega ( or a triglyceride form omega 3 fish oil with approx. Epa 900 and Dha 600) will get into the Meibomian glands and help to produce a much clearer healthier tear film and this will reduce the dry eyes associated with blepharitis. The anti inflammatory properties associated with the Fortifeye Super Omega will also reduce the eye lid inflammation and redness. Dr Lange also likes to add 6 mg of astaxanthin along with some lutein and zeaxanthin in moderate to marked cases of blepharitis for the additional anti inflammatory properties when used together with omega 3. He uses an astaxanthin, lutein product he developed called Fortifeye Focus combined with two Fortifeye Super omega for most of his moderate to marked blepharitis cases. Great for dry eye associated with blepharitis. Most of the blepharitis patients will have a dry eye as well so using a good unpreserved artificial tear if very important. Most of the artificial tears purchased over the counter do not work well however. Dr Lange recommends using a preservative free lubricating eye drop that has hyluranic acid in it like Oasis Tears Plus or Blink tears. These both work quite well in dry eye patients with blepharitits. In the more advanced dry eye patients he recommends using one of those two (blink or Oasis) combined with Retaine tears. 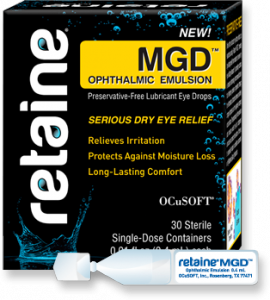 Retaine replaces the outer lipid layer of the tear film that may be compromised in blepharitis patients. Many cases of blepharitis may be advanced or not responding to treatment as quickly as the Socorro or patient woukd like. These patients will benefit from eye lid exfoliations a simple painless procedure done in the office. Currently the two devices used to clean and exfoliate the lids are blephex and lidpro . This procedure usually takes ten minutes , is painless and works quite well at debriding the lid margins and helping to open up the blocked meibomian glands . Many patients after having eyelid exfoliation have instant relief in objective and subjective symptoms .